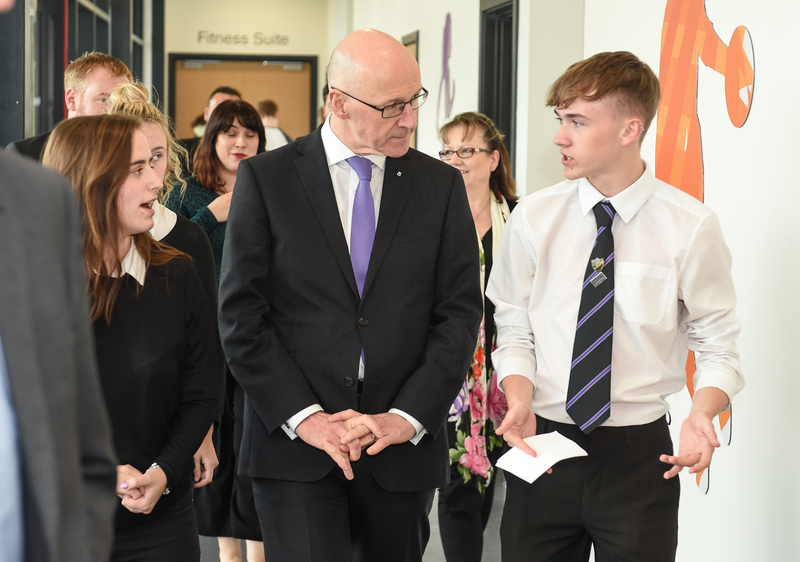 Deputy First Minister John Swinney is guided round Elgin High School by students Tilly Stewart, Abigail Isaacs and Fraser Duncan. Moray’s newest secondary school has been hailed as a “template” for the rest of the country to follow. 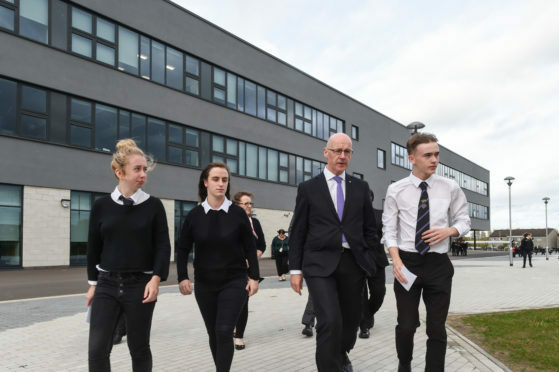 Education Secretary John Swinney, who is also deputy first minister, was yesterday guided round Elgin High School by senior students before officially opening the buildings. The £30 million project was jointly funded by Moray Council and the Scottish Government and opened to pupils nearly a year ago. However, work has continued apace on the transformation since then with the demolition of the previous buildings and the creation of an artificial sports pitch in their place. Construction has already begun on a replacement for Lossiemouth High School while the council is also considering whether a new combined primary and secondary school is needed in Buckie. 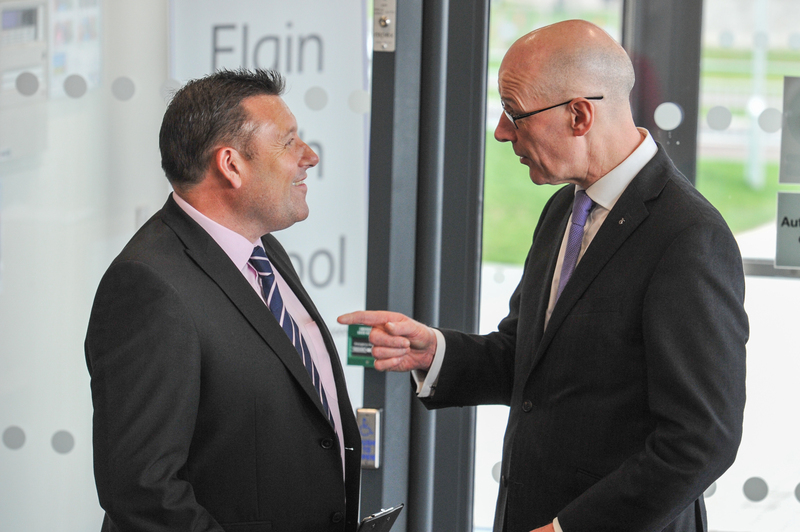 And Mr Swinney believes the “impressive” Elgin High is “undoubtedly a model” for similar projects to take inspiration from. He added: “Two things strike me – physically, the structure of the school creates a central area which has a unifying effect about it to enable connections to be made through different parts of the curriculum. “That kind of thinking encourage the teaching profession to look outside the boundaries of their own classroom at connections elsewhere. Elgin High School currently has a student population of about 600. The new buildings have been built with a capacity of about 800 with the potential to expand it to educate about 1,000 youngsters to cope with the town’s booming population. Head teacher Hugh McCulloch stressed that more than “bricks and mortar” contributed to the school but had seen the new surroundings giving staff and students a lift. He said: “What we’ve always done here is now fully supported by the facilities, which is really what everyone deserves. “It’s been great seeing everyone taking advantage of what we have now – whether it’s playing on the artificial pitch or using the educational facilities like the library or sixth year area.